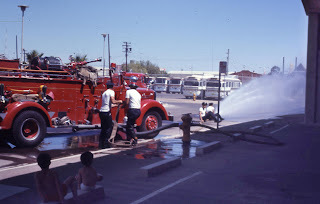 Phoenix Fires: Pumper Practice Using a "Blake Line"
Pumper Practice Using a "Blake Line"
In June of 1971 my dad took some pictures of Engine 1 and Hose 1 practicing laying a line using a Blake Valve. 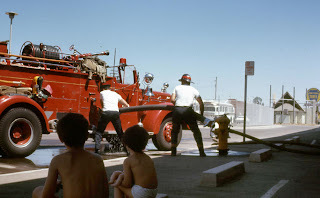 It took me a while to locate where these pictures were taken, because the street is no longer there and the pictures show no street names on the poles. It was on the west side of the 7th st. overpass. 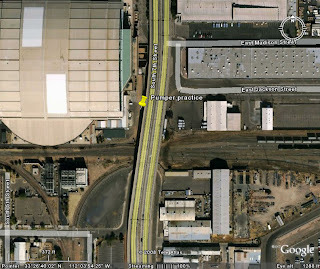 Chase field is now at this location. 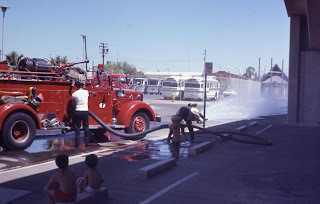 "The rig is Engine 1 a 1952 Mack "L" model with a 1250 gpm pump, a 200 gallon tank and a 935 cid Hall-Scott (The first Hall-Scott in Phoenix) Now owned by retired Fire Chief Alan Brunacini." 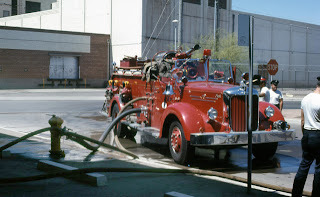 while the rig would continue to the fire." 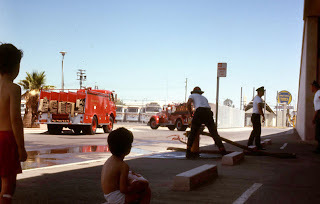 "Once on the scene the crew would make "pullbacks" and extend the line into the fire." 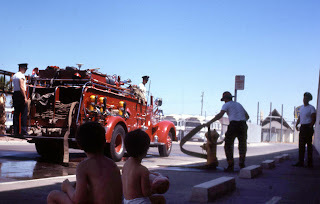 "Then the engine would return to the hydrant and connect the hard suction with a 4" to 2 1/2" reducer to the Blake." 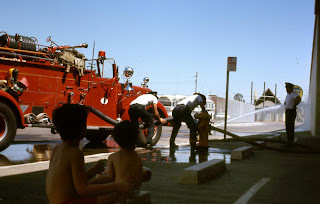 "(All the time water would be flowing through the line just like the Humat valve)"
"changed over" to turn the hydrant line into a line being pumped by the engine." 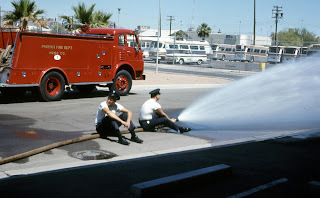 "NOTE: using a Blake valve the engine could only supply a max of two 2 1/2 inch lines through the blake valve." "The Humat has no limit." 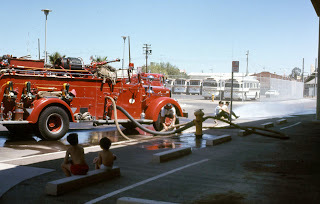 "On a large working fire, if an engine laid a Blake line either the plugman was instructed to not use the Blake, the engine would be making a steamer connection (Using a hard suction hose like in the pixs only connected to the steamer port) or once the engine returned to the hydrant it was removed or could be bypassed which took time." 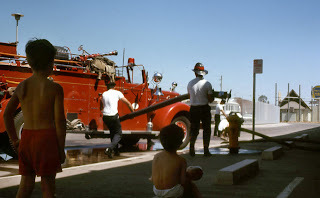 At this time I do not have information as to the identity of the firemen in the pictures.